My friend Elisabeth, who is far more connected in the Vegas community than I am, introduced me to the event Vegas SOUP at Tonopah Community Garden. We attended our first “soup” dinner tonight. I forgot my camera, so I credit Elisabeth with these fabulous photos. 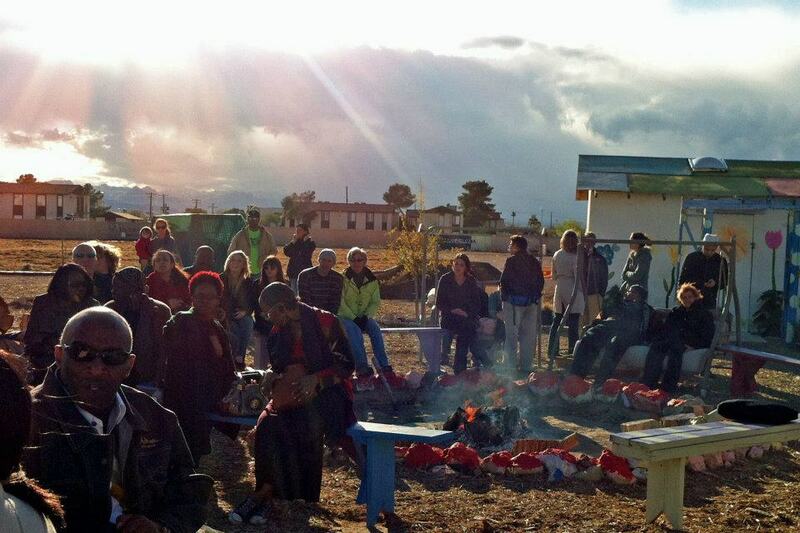 Tonopah Community Garden is a part of the local non-profit Together We Can. They occupy about 4 acres of land just north of downtown Las Vegas. 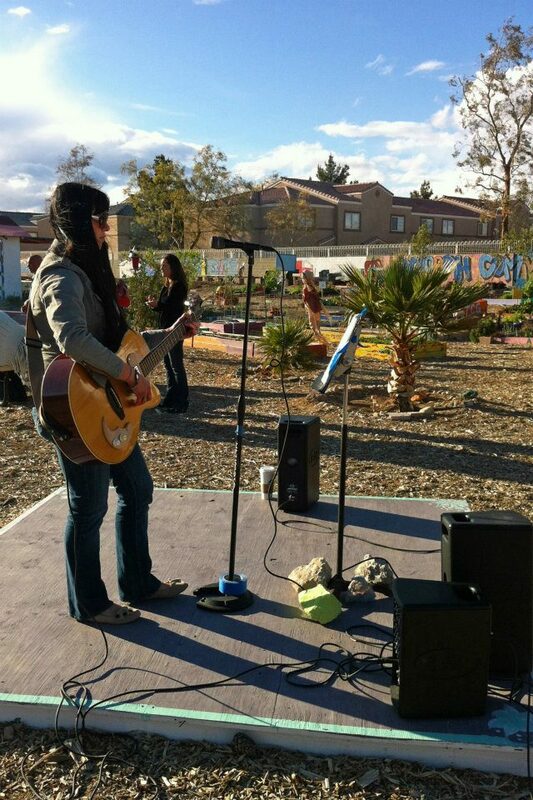 As the first urban garden in Las Vegas, it opened in March 2010. Today the garden grows organic produce and herbs and raises chickens. They used to have goats, but apparently they escaped. I’m sorry I missed seeing the spectacle of goats roaming free in downtown Vegas. 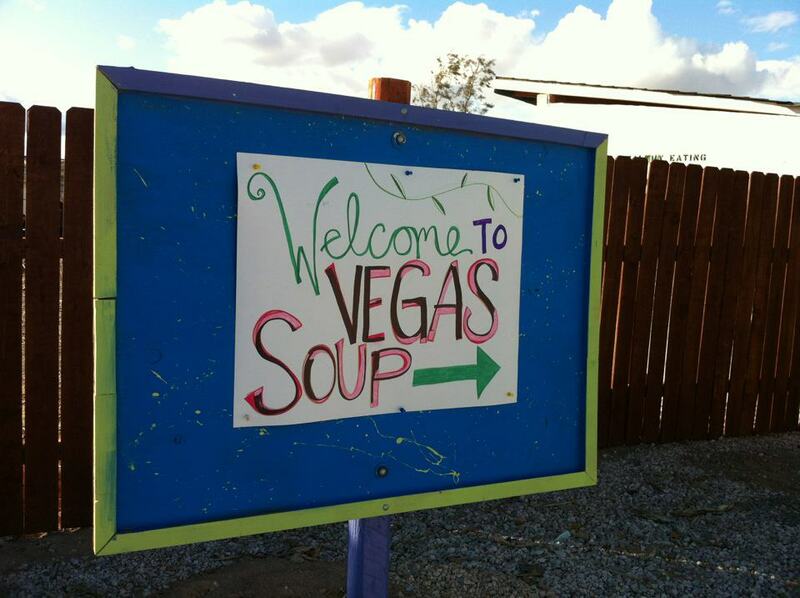 Vegas SOUP is a grassroots micro-grant program that connects individuals from the Las Vegas community to local organizations who work with under-served populations. SOUP stands for Support, Organize, Unite and Create, Partners. For $10 community members get a soup dinner, a handful of community organizations get to present projects and those in attendance get to vote on which organization will receive a grant funded by the proceeds of that evening’s dinner. Despite unseasonably cold (and very windy) weather for Vegas, the event drew a sizable crowd. Sitting around a campfire helped us keep warm. And we were entertained by some great local folk music prior to the dinner and presentations. 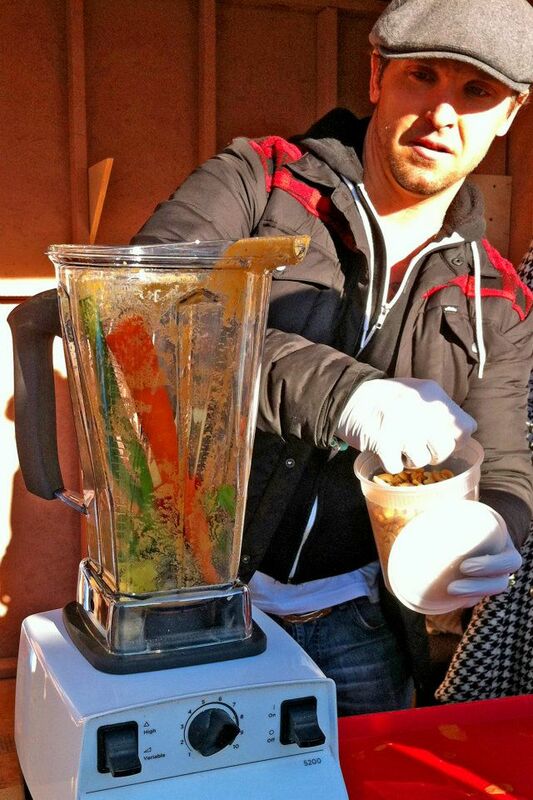 For starters, we got to sample some raw vegan tortilla soup, made to order in a VitaMix blender. The addition of cashews, popcorn kernels and cumin gave it an excellent flavor. 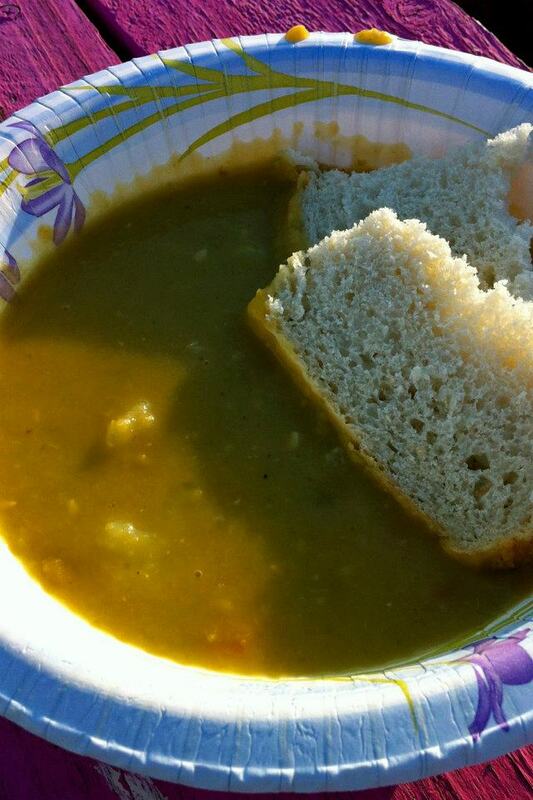 The main event was a delicious vegan split pea soup accompanied by bread. The event strives to be as green as possible (although they ran out of soup bowls at one point), so it’s DIY dishes. 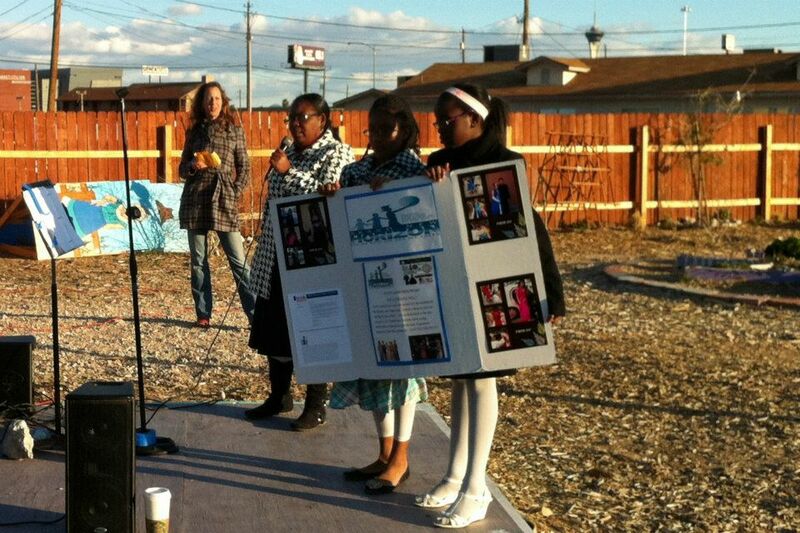 Then it was time for the featured community-based organizations to present their projects. There was Gods Way Cleaning (which provides job opportunities to former felons, ex-gang members and at risk youth), Tony’s House (which provides substance abuse-related recovery services), LACE Grants for Grands (emergency food aid for grandparents raising their grandkids), Brand New Horizon (helping low-income high school kids have a dream prom experience) and COLAB Las Vegas (which promotes local art and architecture). 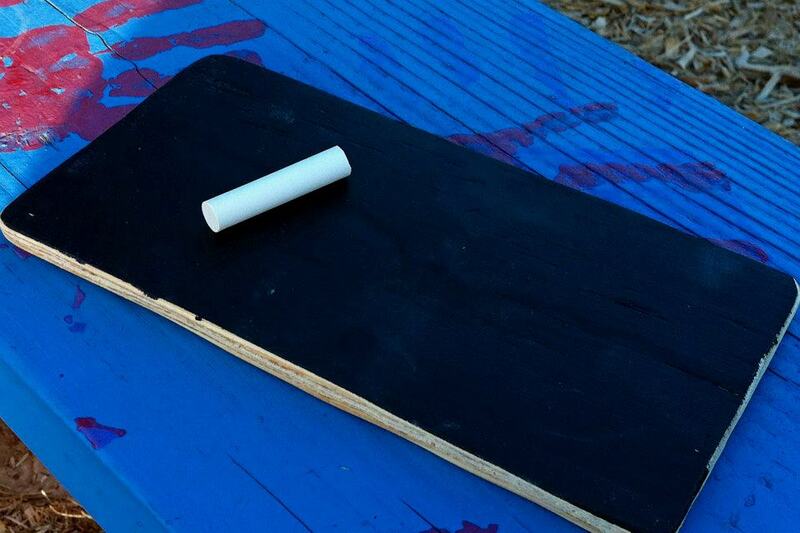 Even the voting was eco-friendly — done on small chalkboards. After the results were counted, Tony’s House took home a $400 grant and runner-up LACE Grants for Grands a $200 grant. 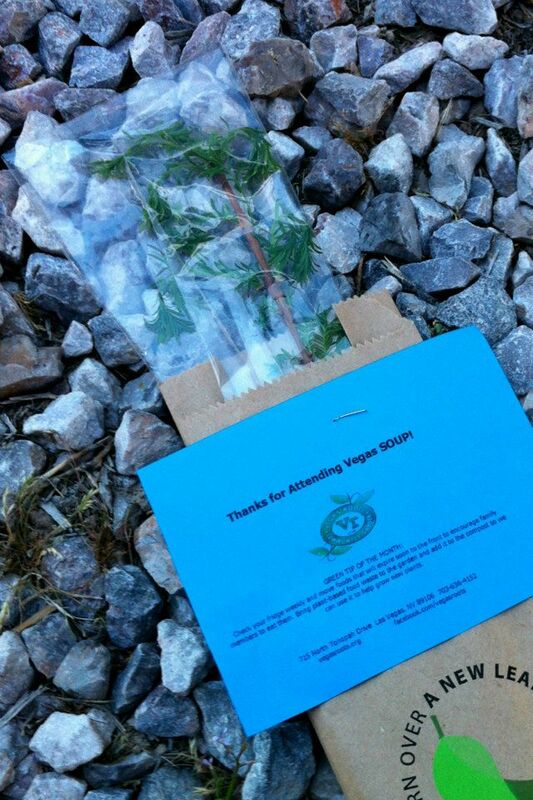 And we took home tree seedlings and copies of the vegan split pea soup recipe as favors. 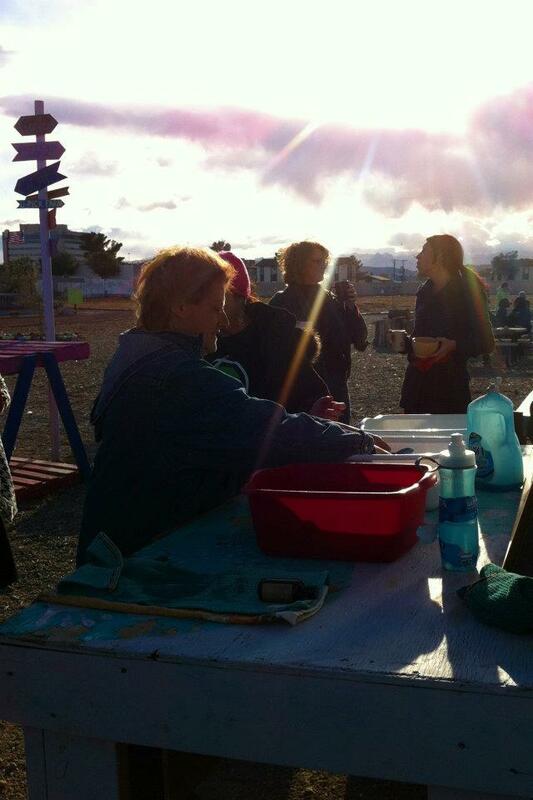 The next Vegas SOUP community dinner is scheduled for Sunday, May 20th. 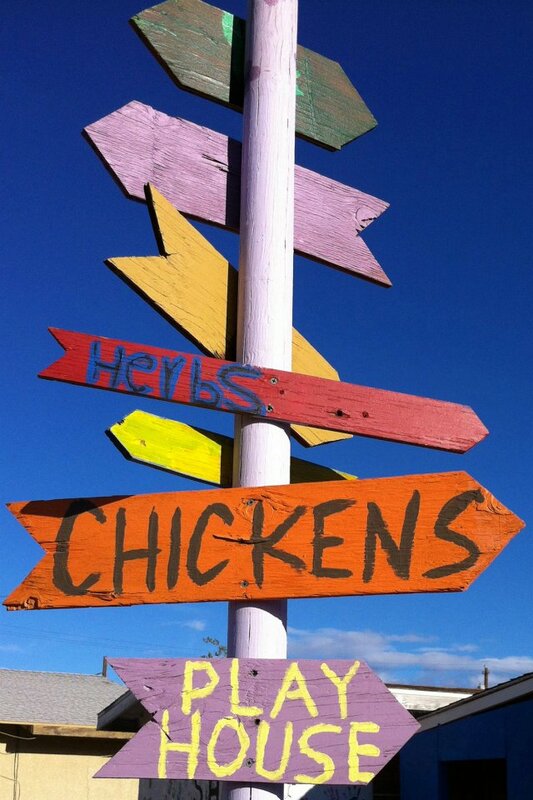 This entry was posted in Becky's Activism, Green Living, Healthy Living, Las Vegas, The Simple Living Experiment and tagged activism, community garden, community-supported agriculture, Las Vegas, simple living, soup. Bookmark the permalink. SOUP sounds like a great event. I used to watch the Tonopah garden blog when they first started but don’t think it’s active any longer. Where did you plant the tree?